A UFO seen plummeting towards Earth has left US Air Force bosses baffled. Footage, filmed in Anchorage in the US state of Alaska, shows what looks like two plumes of black smoke trailing a mysterious object, which appears to have a light guiding its way. A variety of military aircraft operate out of the nearby Joint Base Elmendorf-Richardson, but spokeswoman Erin Eaton said the sighting was nothing to do with them. “That doesn’t look like any of our planes,” she said. Officials from the Federal Aviation Administration added that the object in the video was not an aircraft, and that it hadn’t received any reports of aviation issues at the time. But some experts still think a plane is the likeliest explanation. Peter Davidson, director of the Washington-based National UFO Reporting Center, said that the video showed “a high-altitude jet airliner, with a contrail behind it”. “It is in level flight, but because it is flying away from the camera, it appears to be falling,” he said. Adonus Baugh, who shot the video, was not convinced. 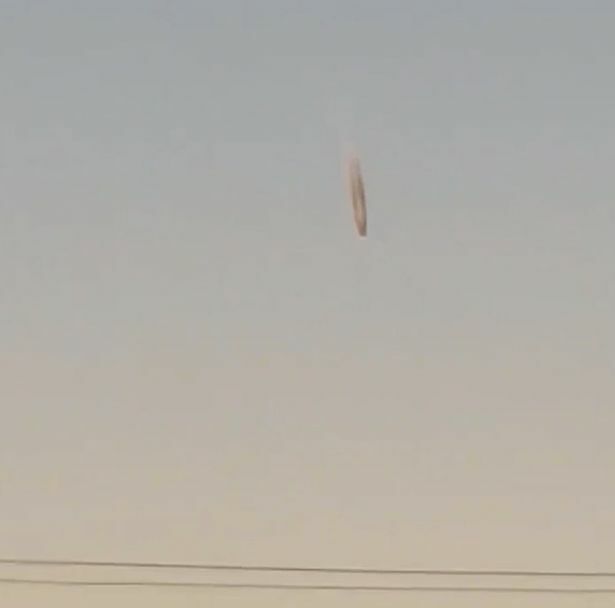 The 18-year-old said the object looked like something coming into the atmosphere. “Me and my mom were just coming in to the parking lot of our house and that’s when I noticed that something was falling from the sky,” he said. “I thought it was a meteor or something coming into the atmosphere. Another witness, Bebe Kang, agreed: “It didn’t look like an airplane or one of those jets. It was big, super slow and red. Aircraft operating out of Joint Base Elmendorf-Richardson include F-22 Raptor stealth fighters, C-130 Hercules and C-17 Globemaster III transports, and E-3 Sentry AWACS command jets.